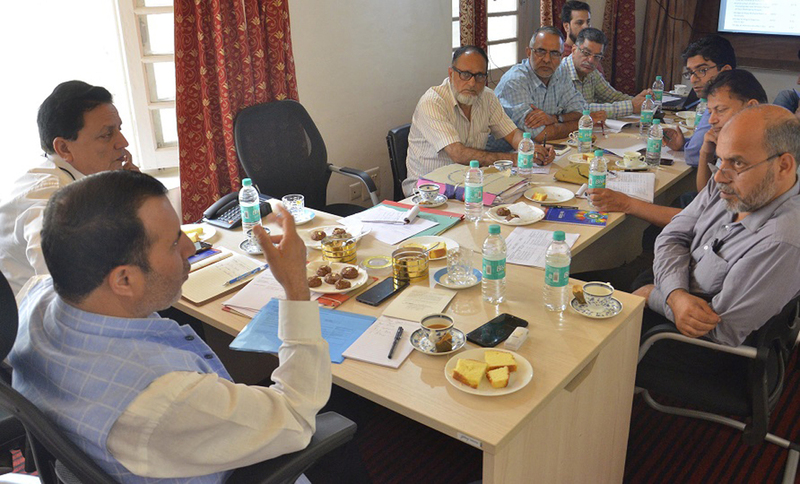 Secretary, Department of Disaster Management Farooq Ahmad Shah chairing a meeting in Srinagar. SRINAGAR, Sept 11: Secretary, Department of Disaster Management, Relief, Rehabilitation and Reconstruction, PHE and I&FC, Farooq Ahmad Shah today chaired a meeting to review the implementation of Rs 1500 crore Jhelum-Tawi Flood Recovery Project (JTFRP) and stressed on the officials to expedite the work. The meeting was attended by CEO JTFRP, Vinod Sharma, Director Disaster Management Amir Ali, Director Finance and other Directors and senior officers of the project. On the occasion officials informed the Secretary about the progress on the project and said that work on the implementation of the project is going in full swing and that DPR preparation and tendering process across all components of the project is being given focused attention. The meeting was informed that under the first component of the project, technical evaluation for the construction of 120 bedded new IPD/OT block at B&J hospital Srinagar has been completed and the financial bid has also been opened while sample DPR for construction of damaged school buildings in the state have been finalized for review of world bank. The officials further informed the meeting that under 2nd component bid document for the construction of 12 roads and 8 bridges in Kashmir division has been prepared for review of world bank while technical bid evaluation for construction of 17 roads and 4 bridges is under process. CEO JTFRP further stated that developmental works worth Rs 206 crore will be executed under first component for construction and strengthening of critical infrastructure while Rs 604 crore will be executed in 2nd component of the project for construction of roads and bridges while projects worth Rs 273 crore will be executed for restoration of urban Flood Management Infrastructure in 3rd component. Under 4th Component projects worth Rs 107 crore will be executed for restoration and strengthening of livelihoods and under 5thcomponent projects worth 159 crores will be executed for strengthening disaster management capacity. To ensure speedy progress over the projects, the Secretary stressed on better coordination between the Project Management Unit (PMU) and the line departments. He urged the concerned officials to monitor the progress of each component and promptly address any issue hindering the execution of the project. He also stressed upon fast-tracking the implementation of the various components across all sectors in order to achieve the project objectives within the set timelines. The Secretary said the department will propose to designate officers, officials who will exclusively work for the implementation of the project and all Project Implement Units shall work under one roof to avoid unnecessary delays.